Mustapha Heron practicing with his new team. @StJohnsRedStorm. St. John's got a major lift just as the season is about to tip off, as junior transfer Mustapha Heron has been granted a legislative relief waiver by the NCAA and will be immediately eligible for the Red Storm in 2018-19. The NCAA has allowed Heron, who played for Auburn for two seasons, to forego the mandated academic year in residence to be closer to his mother, Talia, who has been suffering from severe health issues. Heron, already a 1,000-point scorer, will don the red and white following two standout seasons at Auburn, where he earned Associated Press Second Team All-SEC honors last year for the SEC Regular Season Champions. The 6-foot-5 guard averaged 16.4 points, 5.3 rebounds, 1.2 steals and 0.9 assists per game, helping Auburn compile a record of 26-8 and an appearance in the second round of the NCAA Tournament. He shot 43.9 percent from the floor, 33.1 percent from three-point range and 80.3 percent from the free-throw line, finishing sixth in the SEC in scoring and reaching double figures 29 times. The Sacred Heart High School product tallied a pair of double-doubles, eight 20-point efforts and one 30-point showing while averaging 17.1 points per game during conference action. He was twice named the SEC Player of the Week. Heron exploded onto the scene as a rookie in 2016-17, ranking ninth in the conference in scoring finding a spot on the SEC All-Freshman Team. He averaged 15.2 points per game for the Tigers while also collecting 6.1 boards and 1.3 assists per outing. Thanks to a 44.2 percent success rate from the field that included a 42.3 percent mark from long range, Heron reached double figures in 31 of Auburn’s 32 games, including the first 25 contests of his collegiate career. He also recorded three double-doubles, including a 15-point, 14-rebound outing against Missouri in the SEC Tournament. A consensus five-star recruit coming out of Sacred Heart High School, Heron climbed as high as no. 17 in some national rankings and checked in at no. 25 in the ESPN Top 100 for the class of 2016. 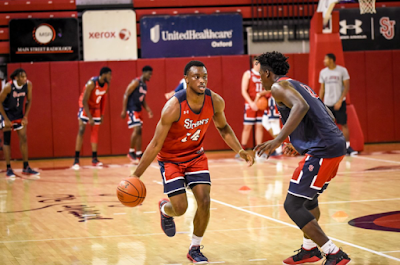 Heron is one of four current members of the Red Storm ranked inside the Top 100 for that class, joining Shamorie Ponds (36), Eli Wright (65) and Sedee Keita (85). Heron garnered three first team all-state selections and became just the second player to win back-to-back Connecticut Player of the Year awards alongside former Providence star and current Chicago Bull Kris Dunn. Heron and the Red Storm will officially open the season on Nov. 6, welcoming Loyola Maryland to Carnesecca Arena for a 6:30 p.m. tip.